Grass Fed Whey Protein Chocolate from Jarrow Formulas is a protein powder made with whey protein from Australian, grass-fed cows and has delicious chocolate flavor. Looking for a great-tasting, hormone-free source of protein to fuel your workouts or just support your overall health? 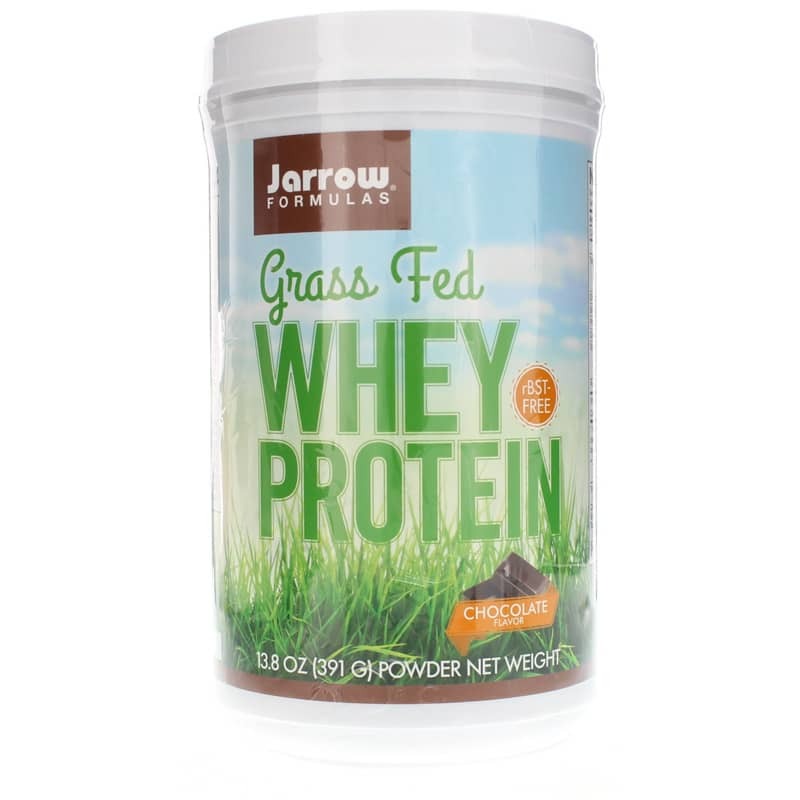 Go green with Jarrow Formulas' Grass Fed Whey Protein in tasty chocolate! 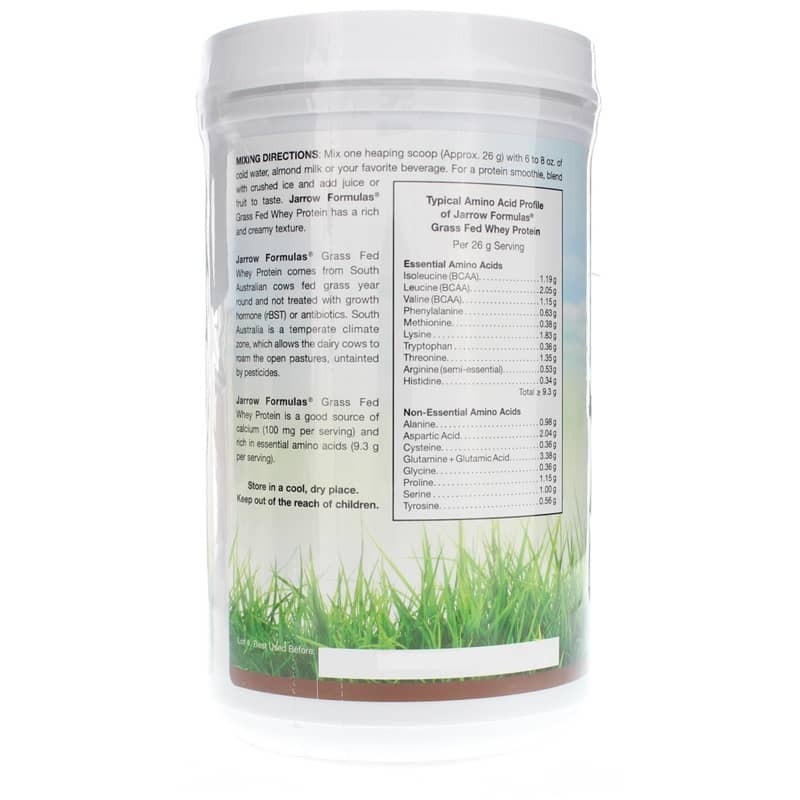 For your health - and the health of the cows - this whey protein powder comes from South Australian cows who are fed grass year-round and not treated with growth hormone. Why Australian cows? Because of the temperate climate in South Australia, the dairy cows are free to roam and graze grassy pastures all year long - that means no poor-quality, man-made feed to get them through the winter. The result is healthy cows that produce milk for whey protein that's rBST and antibiotic free, pesticide free, non-GMO, gluten free, and nutritious. Each serving provides 18 grams of protein, 9.3 grams of essential amino acids and even 100 mg of calcium. And with organic cocoa powder and natural chocolate flavor, you'll love the taste of this protein powder! Good health starts with healthy cows. Order Grass Fed Whey Protein Chocolate today! 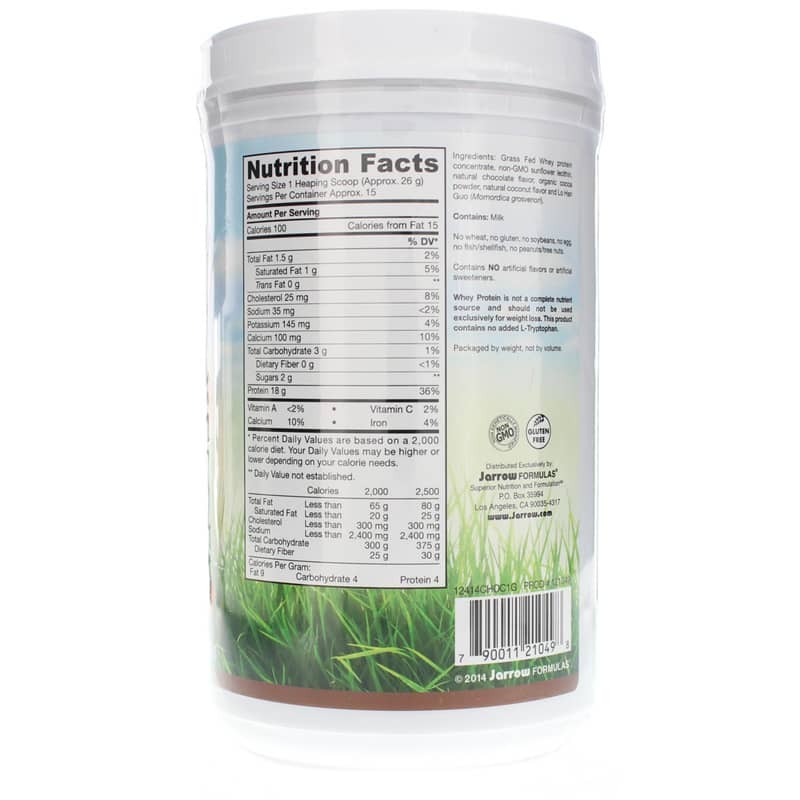 Ingredients:Grass Fed Whey protein concentrate, non-GMO sunflower lecithin, natural chocolate flavor, organic cocoa powder, natural coconut flavor and Lo Han Guo (Momordica grosvenori). Contains NO: wheat, no gluten, no soybeans, no egg, no fish/shellfish, no peanuts/tree nuts. Contains NO artificial flavors or artificial sweeteners. Non-GMO. rBST-free. Adults: Mix one heaping scoop (Approx. 26 g) with 6 to 8 oz. of cold water, almond milk or your favorite beverage. For a protein smoothie, blend with crushed ice and add juice or fruit to taste. Jarrow Formulas Grass Fed Whey Protein has a rich and creamy texture. The service is perfect, kind and thoughtful. They have gtrest products.